Considered the founder of modern linguistics, Noam Chomsky is one of the most cited scholars in modern history. Among his groundbreaking books are “Syntactic Structures”, “Language and Mind,” “Aspects of the Theory of Syntax,” and “The Minimalist Program,” each of which has made distinct contributions to the development of the field. He has received numerous awards, including the Kyoto Prize in Basic Sciences, the Helmholtz Medal and the Ben Franklin Medal in Computer and Cognitive Science. Chomsky introduced the Chomsky hierarchy, generative grammar and the concept of a universal grammar, which underlies all human speech and is based in the innate structure of the mind/brain. Chomsky has not only transformed the field of linguistics, his work has influenced fields such as cognitive science, philosophy, psychology, computer science, mathematics, childhood education, and anthropology. 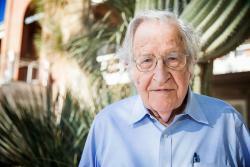 Chomsky joined the UA in fall 2017, coming from the Massachusetts Institute of Technology, where he worked since 1955 and was Institute Professor, later Institute Professor emeritus.